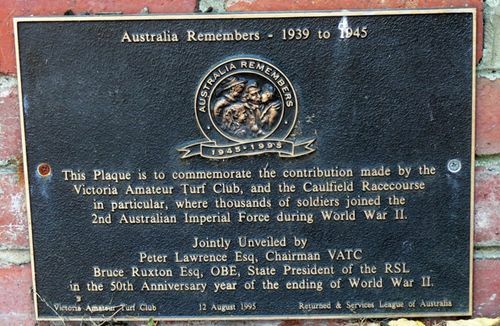 A plaque commemorates the contribution of the Victorian Amateur Turf Club and the Caulfield Racecourse, where thousands of soldiers joined the 2nd Australian Imperial Force during the Second World War. During the war, the army used the racecourse as a recruiting depot, barracks and clearing house for the medical examinations of young recruits. The plaque was unveiled in the 50th anniversary year of the end of World War Two. 2nd Australian Imperial Force during World War II.